Imagine Minerva, Roman goddess and queen of the muses, visiting and inspiring lyricists and songwriters to write signature songs about America and its holidays. Minerva’s journeys take us through the calendar from Martin Luther King Day (“Let There Be Peace on Earth”) to Christmas (“Sleigh Ride”) and culminate with her visit to inspire Katharine Lee Bates to write the poem that became the lyrics to “America the Beautiful.” The songs that Minerva inspire reflect the best modern American ideals – progress through peaceful means; equal rights under the law; appreciation for our immigrants, elders, workers and veterans; freedom of religion; being a land of opportunity. 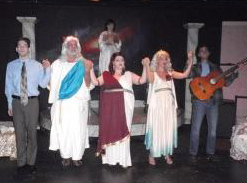 Each scene features Minerva’s visit with an honored lyricist or songwriter and the live performance of his or her signature song. Minimum cast is 6 actors and a live accompanist. Act one has six scenes and is approximately 60 minutes. Act two has four scenes and is approximately 45 minutes. Thank You, Minerva is a work of fiction based on research by the author. No statements are intended to defame any person, alive or dead. No statements are intended to unfairly exploit any person, alive or dead, for publicity. “Can’t Help Falling In Love With You” – Words and Music by Luigi Creatore, George Weiss and Hugo Peretti – www.imagem-music.com on behalf of Gladys Music. All rights reserved. “Oh My Papa” – Music by Paul Burkhard – English lyrics by John Turner and Geoffrey Parsons – Shapiro, Bernstein & Co., Inc.
“The House I Live In” – Music by Earl Robinson – Lyrics by Lewis Allan (Abel Meeropol) – Music Sales Corporation/G. Schirmer, Inc. The notion of Minerva inspiring Americans to create great works goes back to a time long before Thank You, Minerva. 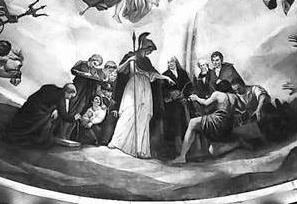 A mural, “The Apotheosis of Washington,” by Constantino Brumidi in 1865, is on the rotunda of the U.S. Capitol. A portion of it shows Minerva inspiring the great scientific work of Benjamin Franklin, Samuel F. B. Morse and Robert Fulton. Here is another example of nineteenth century public art that features Minerva inspiring Americans. A marble mosaic of Minerva by Elihu Vedder in 1896 is along the wall of the staircase landing that leads to the Visitors' Gallery in the Library of Congress. The various fields of learning, listed on a scroll held in Minerva's hand, are: AGRICULTURE, EDUCATION, MECHANICS, COMMERCE, GOVERNMENT, HISTORY, ASTRONOMY, GEOGRAPHY, STATISTICS, ECONOMICS, PAINTING, SCULPTURE, ARCHITECTURE, MUSIC, POETRY, BIOGRAPHY, GEOLOGY, BOTANY, MEDICINE, PHILOSOPHY, LAW, POLITICS, ARBITRATION, TREATIES, ARMY-NAVY, FINANCE and ART OF WAR. Thank You, Minerva, a musical that will uplift its audience. 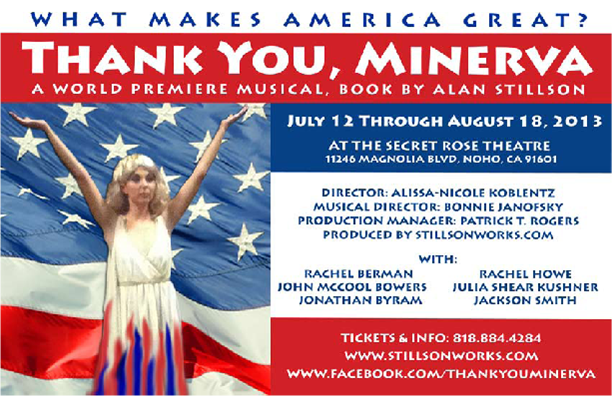 Alan Stillson's THANK YOU, MINERVA, a musical tale that pays tribute to some of the songs that made America great with a little help from the Roman gods, makes its world premiere at The Secret Rose Theatre in North Hollywood. Looking above from their heavenly royal court sits the first family of all the Roman gods; Jupiter (John McCool Bowers), his spouse Juno (Julia Shear Kushner), and their daughter Minerva (Rachel Berman). This family that's been around for centuries, has seen the stark rise and utter fall of their Roman empire. As the world evolved, they look upon the mortals of the earth within their own national empires. Some of these cultures fail, while others succeed. One of these bodies, calling itself “The United States of America” has its up and downs, but shows itself with many of its people that gave goodness through music by way of its songwriters. Since Jupiter knows that American love their celebratory holidays and the songs connected with them, he has his sole child to play inspirational goddess (as she is the goddess of muses), to give some enlightenment to those that pen the words of these future songs appearing in a dream. These songwriters are awoken from their sleep while she gives them a little help in getting the phrases going, only to leave them alone so they can get the job finished! Although they can’t recall her visit, their songs make an impact to the nation and world, from their inspirational meanings by way of celebration as well as speaking of hope, affection, and even with a bit of caution! Of course, the songs that Minerva inspire to write are done through her anonymous means. That is why Roman gods and goddesses exist–to give a little comfort to a world body that may be a bit down and out, but always comes out for the better! This musical play is very unique in many ways. For starters, its a play that takes a bit of Roman mythology, adds a bit of American culture from the 19th and 20th centuries, and shows how one body of people from all walks of lifestyles and cultures are connected through music. It's also very informative, giving a bit of history of what the nation (and world) was going through, and how these songwriters, mostly known for the songs they created while their names got lost through the annals of time, made their unique imprint. The songs and song lyricists range from styles as semi classical, tin pan alley, ballads, and a hint of rock 'n roll! In short, all of these tunes are part of The Great American Songbook. Alan Stillson, who wrote the book as well as additional musical pieces (used as “bridges” where Jupiter tells his daughter to do her muse stuff), creates a stage work that is one part “American Top-40” (the stories behind the hits), second part “Name That Tune” (a fun way to guess the ditty without looking at the theater program to pre discover what songs are being focused upon before the lyrics that Minerva “helps” to writer with gives away the hints), and final part musical stage review! The cast of six players are great with their performances. John McCool Bowers as Jupiter dons a white robe, carries a staff, and sports a white beard and laurel as a crown. Julia Shear Kushner as Juno is the loving spouse to her man, perhaps playing his muse! And the goddess Minerva as performed by Rachel Berman is the shining bean of loveliness. She's there to assist her mostly male clientele, although some would like to join her to bed. (Note: She's not that kind of a gal!!) Three other cast members appear: Jonathan Byram, Rachel Howe, and Jackson Smith, playing the lyricists as well as the cabaret singers that vocalize the final product as sung under the transcribed musical score directed by Bonnie Janofsky. Allissa-Nicole Koblentz choreographs and directs this show that will uplift its audience. Naturally, this reviewer could note what songs are being reviewed, as well as the people behind those tunes. But instead of spoiling the enthusiasm, one would have to experience this production in person. As stated, the song genres will range wildly, and might even have those same audience patrons hum the tunes while leaving the theater space! It isn't often that a show can teach you a few things about American pop culture that makes it fun with a bit of wit thrown it. But the title says it all! So if you are a song lyric writer, and while in slumber you are paid a call from a shining Roman goddess, just say Thank You, Minerva, write that musical number, and watch it change the world–if not bring a tear of joy or sorrow in one's eye! That's is what makes America great!! It's a very patriotic, creative experience. Rachel Berman, and Jonathan Byram. In back is Rachel Howe. 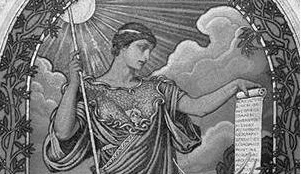 We’re first introduced to goddess and muse Minerva through her parents Jupiter and Juno, both deities themselves. They enlighten us to the many times Minerva has inspired various lyricists and music composers throughout America's history to write wonderful songs about what makes our country so special. It's a very patriotic, creative experience. The cast keeps spirits moving as it plays on our heartstrings with an interesting mix of timeless mythology within our contemporary world. Seeing Rachel Berman's Minerva try her parents’ patience by texting on her smartphone or the way her subjects react to her unexpected presence is funny and engaging. We see the origins of classic songs such as “Let There Be Peace on Earth,” “My Mammy,” “The House I Live In,” “Can’t Help Falling in Love with You,” “America the Beautiful,” and others. The cast members are all very talented. Rachel Berman as Minerva, John McCool Bowers as Jupiter, and Julia Shear Kushner as Juno deliver witty, warm lines. Alan Stillson's original music and words highlight for us songs that played an important part in our country's development along lines of civil rights, during wartimes, the contribution of immigrants, and the importance of our elders. All are tied together and inspired by Minerva. Director and Choreographer Alissa-Nicole Koblentz keeps the historical transitions throughout the times moving steadily and creatively. Everyone's voices blend perfectly together as each scene culminates.